I don’t know about you, but I LOVE LOVE Mexican food, however with diabetes all the tortillas add tons of carbs and my sugars skyrocket:( So, I’m always looking for ways to get the same flavors and make the recipe low carb, that’s how I came up with this low carb enchiladas casserole recipe, which is a perfect diabetic recipe for enchiladas. The other factor in coming up with this low carb enchiladas recipe was how much zucchini I had in my garden… SO MUCH!! & the zucchinis are huge!! So it was an easy decision to choose zucchini instead of the tortillas. I sliced the zucchini super thin on my mandolin, which was a new purchase for me. I’ve sliced the zucchini myself before for other recipes, but I wanted this one to be super thin, so I bought one. I was always scared I’d slice a finger off, but I managed to keep all 10 digits. If you are a super diligent cook, you could pre-cook the zucchini and dry it out to remove some of the water. But, I’m 1 step Charlie over here, so I definitely just used the zucchini raw. I started by cooking the ground turkey with some spices. Usually I would add salsa, but instead I added taco seasoning to keep the ground turkey kind of dry since I knew the zucchini would add water to the dish and I didn’t want it to be super soupy. After the meat was all cooked up, I added a layer of zucchini slices, meat, cheese & ricotta (sounds strange, I know), then started all over again. Except I only added one layer of ricotta in total. If you prefer cream cheese you could substitute that for the ricotta. I have to say the ricotta worked really well at creating a little structure when I cut pieces so they stayed together in a little square shape. 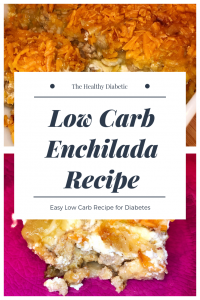 This is such a delicious low carb enchilada recipe, this enchilada recipe is perfect for diabetics. 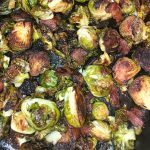 Tons of flavor without all the carbs!! Cook ground turkey with spices until cooked through. Grease your baking dish (i used an 9 x 6 pan). 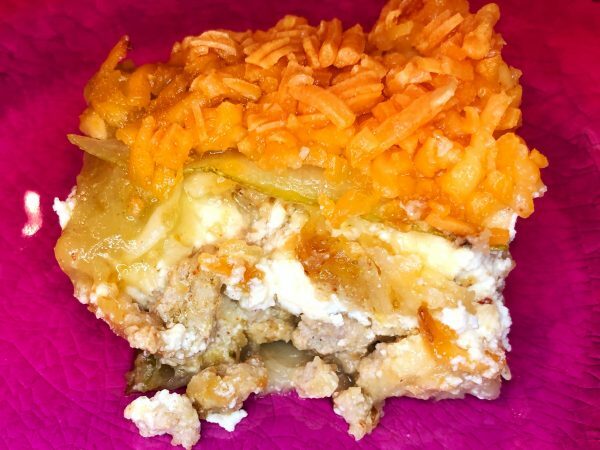 Start layering: zucchini meat cheese ricotta cheese Then start again with zucchini meat cheese Then again, zucchini & top with cheese.